Adding a Date stamp or Plot stamp to the drawings is something that I have done for many years. It is a little piece of text that is located on your border that is updated every time you open your files. It is created with Fields. It is not part of the titleblock because it contain information that is not of use to the client. I place it in the lower left corner, just outside the border lines. Some of the critical fields that I add are user name and file location. This allows me to find the file if I only have hardcopy to go by. It also allows me to find the user that last plotted the file. This is helpful when you have a stack of uncollected plots in the plotter. So at a minimum add File name, Folder, Time, Date and User Name. To use a Field – you have to create an MTEXT object and Insert a Field. 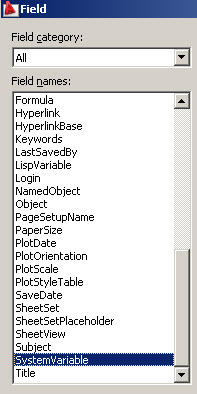 As you can see from the screen shot below – there are a lot of Field Names you can insert into your drawing. I to also like using the Date stamp. But at the company I work in we are using an image and plotting portions of it. So when I do the Plotting preview you can see the date stamp but it does not plot it because the image is in the same location of the date stamp. So I am looking for a way to plot the date stamp without the image affecting the plotting of the date stamp??? We are interested in if we can turn the auto date feature off when we print a set of plans that has no charges. Does anyone know how to this?